Beginning in 2010 and running through 2021, the U.S. Mint will issue a new quarter series – commemorative quarter dollar coins featuring America’s national parks and other national sites with natural or historical significance. The new 12-year program is authorized by the “America’s Beautiful National Parks Quarter Dollar Coin Act of 2008.” This legislation was approved by the U.S. House on 07/09/08 and U.S. Senate on 12/10/08 – and was signed into law as Public Law 110-456 by President George W. Bush on 12/23/08. The law instructs the Secretary of the Treasury that a national park or other national site in each of the 50 states, the District of Columbia, and the five U.S. territories will be honored on a quarter dollar coin. The territories include Puerto Rico, Guam, American Samoa, the U.S. Virgin Islands, and the Northern Mariana Islands. 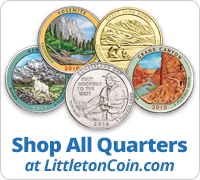 The 56 different quarter designs will be minted and released at the rate of five new issues per year from 2010-2021, in approximately ten-week intervals, in the order that the locations were established as national parks or sites. (Our release schedule will be updated as release dates are announced.) Once the production period for each issue has ended, no more coins of that design will be struck for circulation. The national park or national site designs will appear on the reverse side of U.S. quarter-dollar coins, while the obverse side will continue to feature a portrait of George Washington. In addition to the year of issue, quarters struck for commercial use will bear a “P” or “D” for the Philadelphia Mint or Denver Mint, signifying where the coins were produced. Proof coins, struck by special process to the highest standards of the coinage art, will bear the “S” mint mark of San Francisco and will be available in both clad and 90% silver versions. While the national parks and sites program is scheduled to run for 12 years from 2010-2021, the enacting law gives the Secretary of the Treasury discretion – at any time before the end of the ninth year of the program – to authorize a second cycle of national park and national site quarter dollar designs representing the 50 states, the District of Columbia, and the 5 U.S. territories. The law also instructs the Secretary of the Treasury to strike and make available for sale 99.9% pure silver bullion versions of the national parks and sites quarters – featuring a diameter of 3.0 inches, weight of 5.0 ounces, and with the fineness and weight inscribed upon the edge of the coins.